214 pages | 19 B/W Illus. For many, small firms are everyday realities of the economy and visible in every high-street and industrial estate. Their existence and importance is unquestionable. Such beliefs are understandable, but the authors of this new book would suggest they are misguided. The Political Economy of the Small Firm challenges the assumptions regarding small firms that pervade society and political representation. Small firms are not organised into a homogenous sector that has a clear constituency or political influence. In fact, the small firm is shown to be an inconstant political construct that is discursively ethereal and vulnerable to political exploitation. 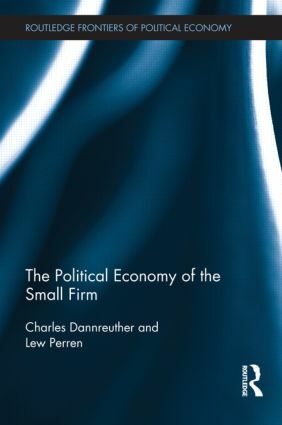 Fusing theories from political science, management and linguistics, Dannreuther and Perren assert that the idea of the small firm is an important discursive resource used by political actors to legitimise their actions, influence their citizens and help sustain regimes of accumulation. On top of this, the authors also empirically test their claims against 200 years of UK parliamentary debate, from the Industrial Revolution to the Blair government. The political construction of the small firm is shown not only to provide rhetorical mechanisms to maintain periods of capitalist accumulation, but also to increase the relative autonomy of the state and to centralise power to elite politicians. For a period of 150 years up to the 1970s, the small firm was an unexplored presence, below the political radar and resonant with poor working standards and extreme forms of competition. During the so-called Fordist period from the 1930s, the small firm was seen as the dirty, out-dated, contrast to the clean, modern future represented by mass production and corporations. The perceived failure of Fordism led to the invention of the small firm and its presentation as an ideal political construct. By fabricating assertions of what small firms are and what they want, frequently out of conjecture, the authors of this book show how political elites have been able to advocate radical reformist agendas since the 1970s in the name of a phantom constituency. Charles Dannreuther is Lecturer in European Political Economy at the University of Leeds, UK. His interest in small business policy has informed contributions to international political economy, regulation theory and European public policy. Lew Perren is Professor of Management Research at the University of Brighton, UK. His research into management and entrepreneurship has tended to be interdisciplinary in nature, often drawing upon influences from linguistics, sociology and philosophy.